New Delhi, June 4th – India and Israel have a strategic partnership in the field of agriculture, at the core of which are the Centers of Excellence (CoE), under the Indo-Israel Agricultural Project. These centers are benefiting Indian farmers through demonstrating a value-chain aimed at increasing quality, productivity and diversity of crops. The 22 CoEs across 9 Indian states are used as platforms to transfer Israeli technologies and know-how to Indian farmers. Within the Working Plan 2018-2020, Post-Harvest Management (PHM) is one of the key segments to be added to the value chain demonstrated in the CoEs. 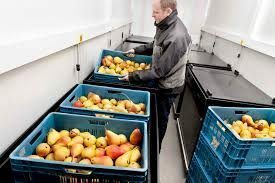 PHM refers to the stage of crop production immediately following harvest and it covers Cleaning, Grading, Sorting, Cooling and Packing. Mr. Menashe Tamir, an Israeli-MASHAV expert on Post-Harvest Management, together with Mr. Dan Alluf- Counsellor, International Development Cooperation (MASHAV), conducted Field-visits at four Centers of Excellence in Rajasthan (Kota), Haryana (Karnal) and Punjab (Hoshiarpur and Kartarpur) from May 27 to June 3, to share expertise on PHM solutions and define models of implementations.